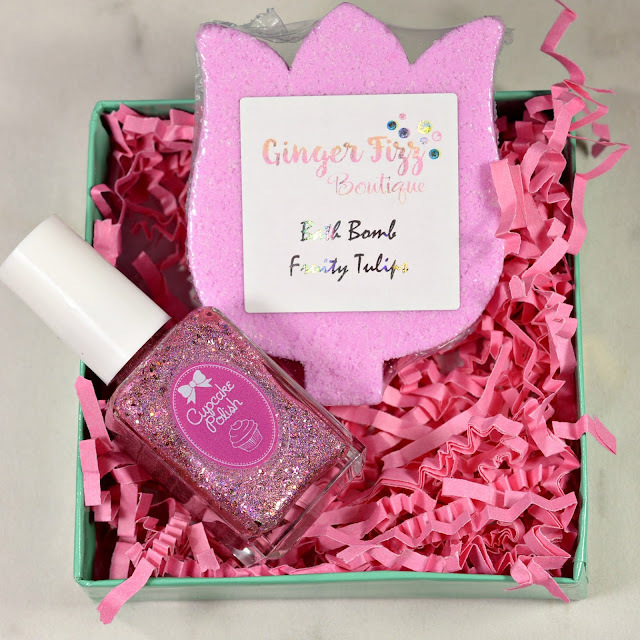 Cupcake Polish announces a Mother's Day collaboration with Ginger Fizz Boutique, a new and talented bath and body store. Ginger Fizz Boutique is owned by Shelly- who is the mother of Sara, the owner of Cupcake Polish. Both Shelly and Sara love to create luxurious items to help other mothers and daughters pamper themselves. Ginger Fizz Boutique has contributed a Fruity Tulip bath bomb that is pink in color and has a delicious fruity scent! It may be broken into smaller pieces to use as a luxurious mani soak or used as a bath bomb for a fun and fruity bath. This bath bomb is perfectly paired with a limited edition nail polish from Cupcake Polish called When Tulips Meet. When Tulips Meet is a light pink linear holographic nail polish with silver flakies, pink to orange shifting flakies, and iridescent glitter. Cupcake Polishes are handmade, long-wearing, full coverage, and 5-free. Ginger Fizz Boutique bath bombs are highly fragranced. If used as a bath bomb, please use caution when exiting the bath tub. are ONLY available at www.gingerfizzboutique.etsy.com. This set launches on April 8th at 12pm CST.